"The best things come in small packages." This familiar saying certainly applies to the small, and ever so loveable, creations from Samantha Lutterotti of Sammibears. Though relatively new to the industry, her passion for crocheting was honed at an early age. 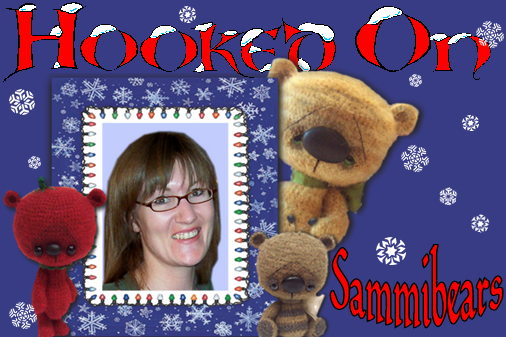 Sammi's mother taught her the crocheting skills when she was sixteen. 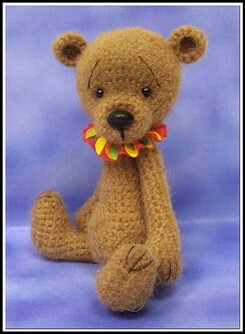 However it wasn't until 2003, that she decided to use her talents to make bears. 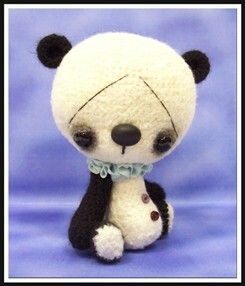 While looking at online auctions, she noticed how charming another artist's thread bears were and felt that she needed to create one of the tiny companions for herself. 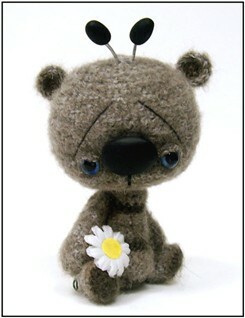 Inspired by other artists in the field of thread bear designs, Sammi got "hooked" on a particular style called Anime. 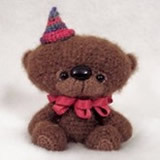 "Next to my boys and husband, my passion lies with crocheting my little bears," she added. 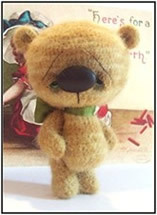 Now she is best known for her big-headed anime style bears, and collectors may also recognize her bears by their noses. In 2006, she started making the noses from polymer clay. In order to reach her goal of appealing to a wide variety of collectors, she continues to create in both traditional and anime styles. Currently on maternity leave from her job at the University of Lethbridge, with her second child, Ottavio and busy caring for her first born, Hunter. Sammi makes her home in the town of Lethbridge, Canada. 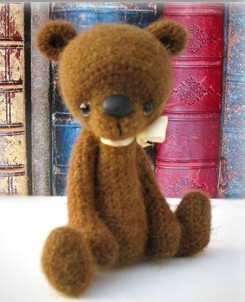 Motherhood has consumed most of her days leaving bear-making her only "true" hobby. When not crafting bears, she spends time with her children and husband, Dave, camping, playing in the parks or enjoying game night. Although she has not any attended any bear shows, she looks forward to someday participating in one. Most of her sales are done exclusively through her web site or through online auctions. Crafting between thirty and fifty-five bears per year, she usually will design at least two bear patterns each year, tweaking each pattern as she goes to create a unique new bear each time. "As I grow as an artist, I am continually making alterations and improvements in the constant search for the 'perfect' pattern." "Just knowing that someone has fallen in love with one of my creations is highly rewarding." Sammi said. She has been awarded several URSA Awards for her creations. But her warmest thoughts, as an artist, are of a more personal nature. "A few years back, my father became very ill and was hospitalized. 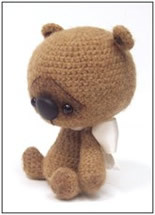 I crocheted him a companion to keep with him during his trials in the hospital," she continued. 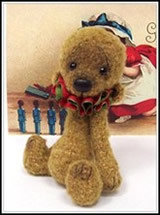 "He kept the small bear with him always in the pocket of his robe until one day, it was sent off to the laundry with the teddy still in the pocket." "At first, my dad was very upset because he lost his little buddy who reassured him whenever his spirits needed a lift, but then it occurred to him that some other patient would reach into their robe and find a furry friend." Sammi recalled fondly. "It comforted him to know that someone else may find strength, encouragement, and a much needed smile from finding my creation in their pocket." Those are just the sort of rewards that keep Sammi crocheting and collecting tiny teddies.